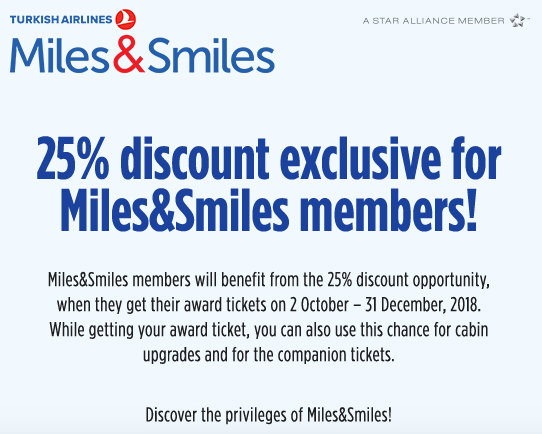 Turkish Airlines just announced a new Miles&Smiles promotion offering a 25% discount on domestic award tickets (including Companion Award) and upgrades for travel until 31.12.2018. This promotion is targeted exclusively to domestic tickets that doesn’t include other ticketing regions. Turkish Airlines Miles&Smiles often runs these promotions but they are rarely universal for the entire system and rather limited to specific regions, in this case for domestic flights within Turkey. You can access the Turkish Airlines promotional website here. The reservations made under this promotion have to ticketed and flown until 31 December 2018. This promotion will be applied for the tickets which are issued after 02.10.2018. Travel date must be between 02.10.2018 – 31.12.2018. Promotional award tickets must be issued before 31.12.2018. Promotion is valid for all economy and business award classes. This promotion is valid only for Turkish Airlines scheduled flights. It is not valid for Codeshare flights operated by Turkish Airlines and Anadolujet and award tickets for Star Alliance partner airlines. Promotion is valid for domestic flights. Domestic flights within Turkey are usually quite cheap so I’m not convinced that it’s a good deal to use miles for such flights unless the member really has no other use for them. Sometimes there are instances where it can make sense to use miles even if fares are moderate like Turkish Airlines where one can take advantage of the companion fare which in combination with a sale such as this one makes for a somewhat reasonable price/value ratio. In the end it boils down to comparing prices and if you could use the points for a better purpose otherwise. Within the promotion, routes in different award regions cannot be combined. Award tickets can not be issued as open tickets. Award tickets, one-way award tickets, companion award tickets and upgrade rules of Miles&Smiles programme, are valid for this promotion. Previous articleMarriott Rewards Starting To Phase Out SPG Branding?